AP PHOTO - Iowa’s Spencer Lee, left, celebrates his win over Virginia’s Jack Mueller in their 125-pound match in the finals of the NCAA wrestling championships Saturday in Pittsburgh. Nickal embodied that on a weekend the Nittany Lions totaled nine pins, seven major decision and two technical falls. Nickal had three pins before beating Ohio State’s Kollin Moore 5-1 for his third title. Nolf beat Tyler Berger of Nebraska by major decision, 10-2. Lee, the No. 3 seed, scored takedowns in the first and third periods, and forced a pair of stalling calls on Mueller to win the title for the second-straight year. 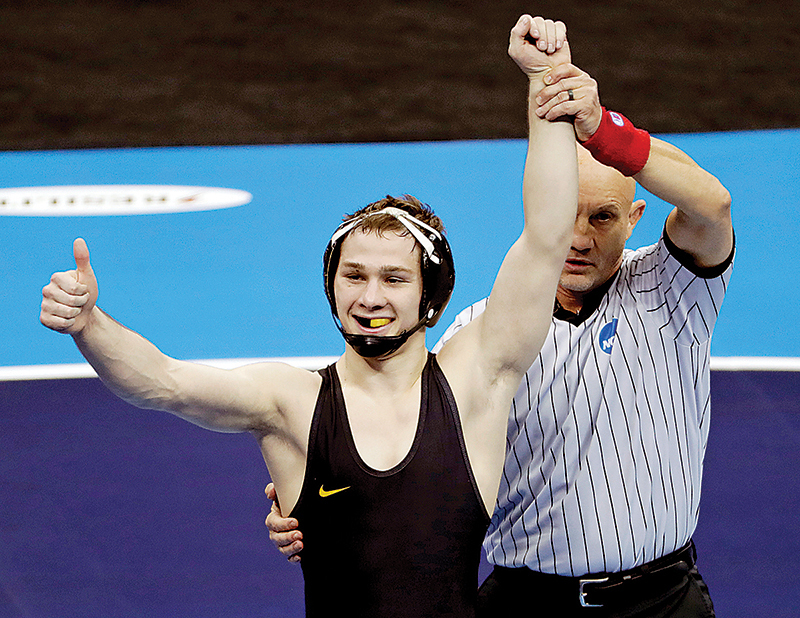 “[Assistant coach] Terry Brands always tells me big-time wrestlers show up at big time moments. 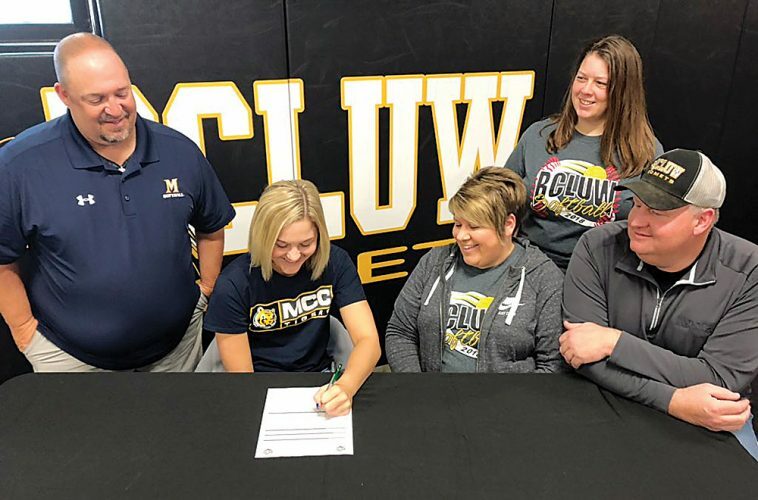 We preach that at the University of Iowa, and everyone on my team believes that they’re a big-time wrestler because that’s the mindset you have to have to be in this sport,” said Lee, who became the 17th two-time champion in school history and first since Mark Perry in 2007-08. 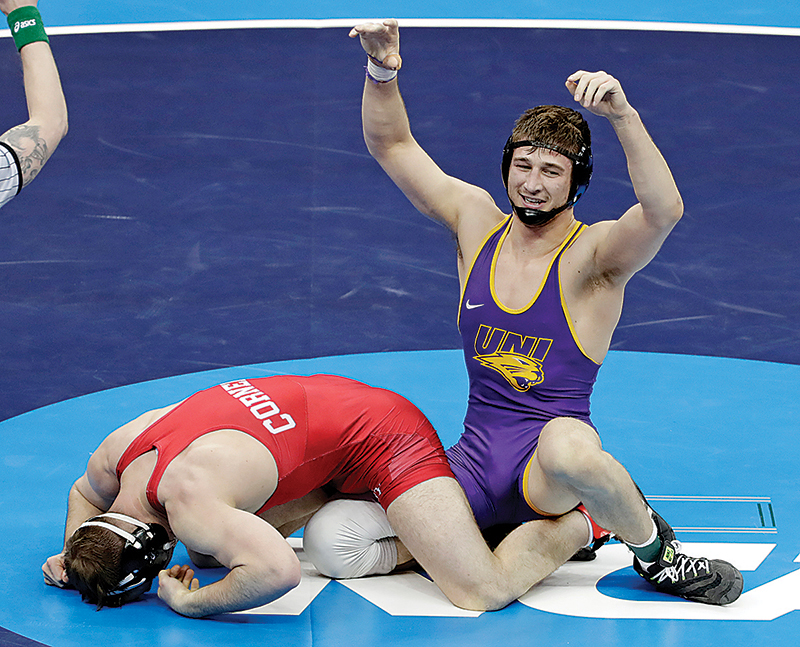 Drew Foster (184) won Northern Iowa its first title in 19 years with a 6-4 win over Cornell’s Max Dean. He scored a takedown inside the final 30 seconds and rode it out to victory. Foster is UNI’s first champion since Tony Foster won in 2000. The Panthers hadn’t had a national finalist since 2005. 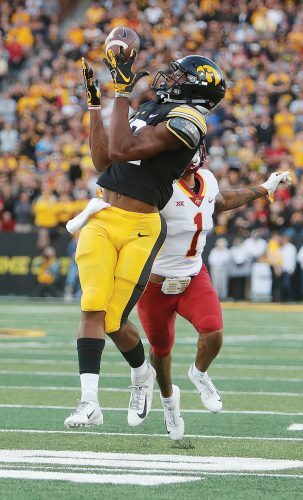 The Hawkeyes placed fourth with 76 points. Iowa crowned six All-Americans, including Lee, Austin DeSanto (133), Pat Lugo (149), Kaleb Young (157), Alex Marinelli (165), and Jacob Warner (197). Northern Iowa tied for 13th with 40.5 points, its highest finish in head coach Doug Schwab’s tenure. Bryce Steiert fell to Iowa’s Marinelli 9-3 for eighth place, giving UNI two All-Americans. Iowa State took 16th place with 32 points, led by All-Americans Jarrett Degen at 149 and Willie Miklus at 197. Miklus came away with sixth place and Degen, seeded eighth, finished seventh. Degen defeated Iowa’s Lugo 11-9, in the medal match, while Miklus fell to Josh Hokit of Fresno State, 7-2.